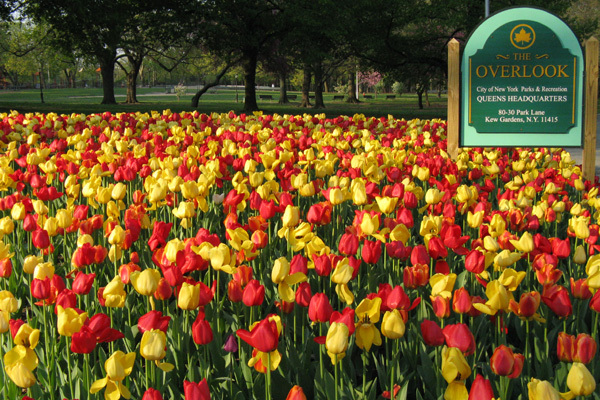 If you are a person who reads this blog regularly you know that I recently moved to Queens and spend quite a bit of my spare time in Forest Park. It is near my apartment, it is beautiful, and it is a great place to see birds. Beyond that though, it is as near to a complete forest ecosystem as may be possible in the midst of such a massive urban area. Sure, top predators like bears don’t roam the woods but wild bears in New York City probably wouldn’t be such a good idea anyway. Jory, who has contributed a couple Welcome Wednesdays to 10,000 Birds, mentioned to me that as much time as I spend in the park I haven’t ever really shown what it looks like. So, for Jory and everyone else who might be interested, I present, without further ado, Forest Park (well, the eastern undeveloped part anyway). The picture above is actually of Union Turnpike, the road I walk along to get to Forest Park. It is very busy, and between it and other nearby streets and parkways one never gets to enjoy just the sounds of the forest, but one listens to the sounds of the forest with cars buzzing in the background. Nonetheless, the first part of the park I see is quite a sight, especially in spring. The summit is a hill barely deserving of the name out of the left side of the frame of the picture, and behind the summit is the park headquarters, a small building that houses administrative offices and whatnot. My walk across the field there is often productive for birds early in the morning but any other time of day the activity of people and their dogs usually means that all I see are pigeons, starlings, robins, and sparrows. Once I traverse the open field I take a path through a narrow strip of forest that is hemmed in on one side by a complex of big apartment buildings and on the other by Forest Park Drive. Though there is not much to this section it is often productive for at least one bird that I want to get a second look at through my bins. Once I’ve walked through this tiny chunk of the park I cross Metropolitan Boulevard, a rather busy street, and enter the park on Forest Park Drive, a paved road that is closed to motor vehicles. 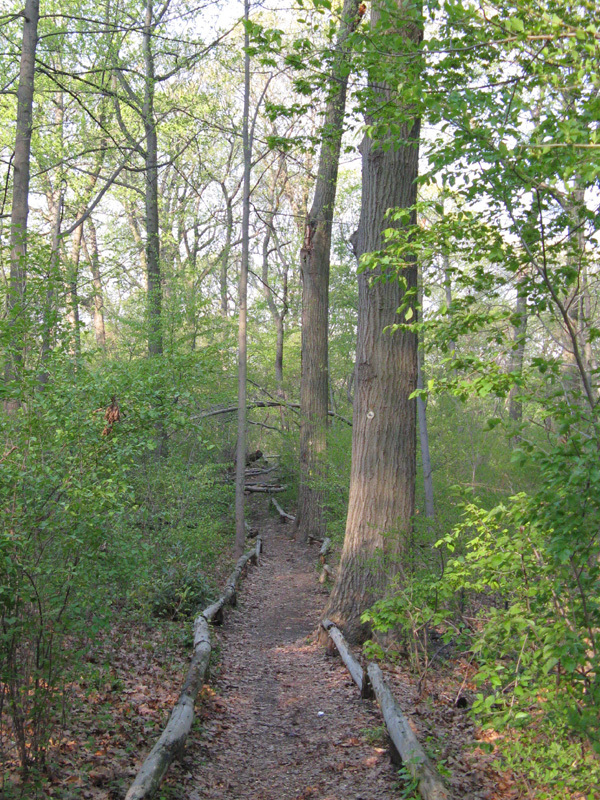 I quickly take a right onto a small trail lined by rough-hewn guardrails intended to keep people from wandering off the trail and crushing the vegetation (this seems to work rather well: note the thriving understory in the shot below). Shortly after the trail takes a turn to the left the waterhole, the best birding spot in the park, comes up on the left-hand side. 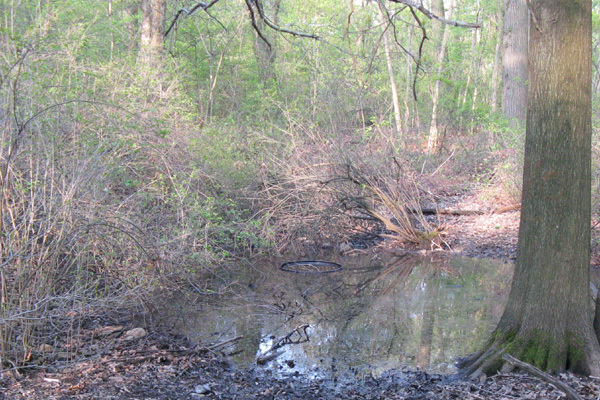 The waterhole is a kettle, that is, Forest Park’s topography, like much of Queens’, was created by glaciers, and the knobs and kettles that have been largely destroyed as Queens was developed are still present in Forest Park (and other parks in Queens) so people can see what the heck knob-and-kettle topography looks like. I apparently chose a poor year to move to Queens and make Forest Park my home away from home as the waterhole has been greatly diminished this year due to lack of rain, though recent showers have reinvigorated it somewhat. Apparently, in years with more rain the spot I took the above picture from would have been underwater! Despite the minimal amount water in the waterhole this year the birds still come to drink and bathe, as this is the only spot with water in the whole eastern half of the park. I have spent many an hour sitting with my back against a big tree watching the birds come and go and have loved every minute of it. From the waterhole I had been making my way to the feeder array but now that spring is really here feeding has been discontinued until next winter. So I tend to wander on trails until I eventually get to the equestrian trail (apparently you can rent horses and ride them through the park) and then I wander in whatever direction the most bird song seems to be coming from. If you look carefully in the picture above you can see a dogwood tree in bloom in the middle of the shot. Dogwoods are a big part of the understory in Forest Park and I had never seen so many until I moved here. The day I took all of the pictures above I had left my trusty SLR at home and borrowed Daisy’s point-and-shoot camera both because my right shoulder, on which I always carry my camera, hurt and because I wanted to play around with a camera that I haven’t really familiarized myself with yet. So, of course, on the day when I was woefully unprepared for bird photography I got my best looks ever at a gorgeous male Hooded Warbler (what, you thought I would go the whole post without mentioning a bird sighting?). 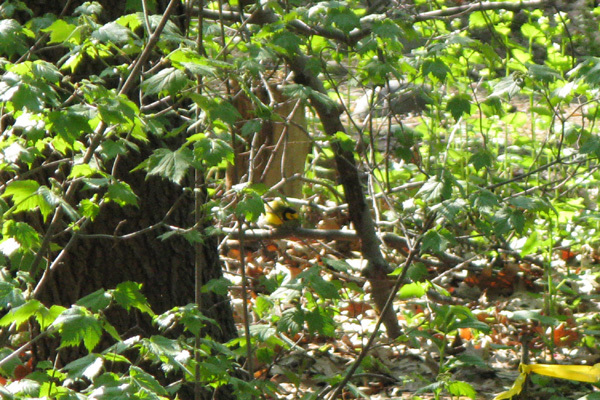 The result of my best efforts (which hardly even deserves the title “record shot” is below…can you even see the warbler? I’ll eventually do another post like this about some other features of the park, but I’ll leave you with this shot, which conveys, I think, some of the majesty of the towering oaks above (and those aren’t even the big trees!). Lived here for almost sixty years. Cannot move due to Forest Park being heaven on earth. Ironically, two bodies recently found near Park Lane South. I love the birds, chipmonks, Raccoons, and squirrels. Maybe I will write again. enjoy the birding. Alice, I can’t blame you for not wanting to move away…I’ve only been here for two months but I love the park already! Al, I’m glad Alice provided the answer because I had no idea! I agree with Alice… the pond in question most probably was Jackson Pond, which was at the intersection of Park Lane South, Myrtle Ave & the Park Drive. I remember people both ice skating and model sailboating. I was kind of sorry when they changed it over to what it is now, basketball courts and a small garden area. But the basketball courts are frequently in use, and the garden does sometimes attract some sparrow species not found deeper in the woods. btw, one of the interesting tidbits I gleaned from a “natural disasters” class I took at Queens College a few years ago is that Richmond HILL,is so-called because there is an actual increase in elevation. In the event of a Force 5 Hurricane, the resulting flood surge would have everything south of Richmond Hill underwater! ps I have lived here only slightly less than Alice, and I have always been grateful to have such a wonderful park to enjoy. great park. took my son for a walk there a few days ago. In fifteen minutes we’d found one salamander, one toad, and saw a chipmunk. Felt like I was away from the city. @Jean: Thanks for the info! @Steve: Once fall migration starts try to get to the waterhole…you and your son will be amazed by the number and variety of birds! I’ve lived in Queens most my life and have only recently heard about Forest Park. I found your website googling Forest Park. I want to go check it out this week. Can you tell me where the best spot is to park my car and enter the park to see the eastern side, which I understand is the undeveloped side? And how do I find the horse stables? Thanks, Patrick. @Patrick: I would park on Park Lane South on the southeast side of the park. I have no idea where the stables are. In case you folks in Richmond Hill aren’t aware, there is more to the park on the other side of Woodhaven Boulevard. There, you will find the beautiful Strack Pond, a restored kettle pond.I am happy to find your blog, Corey. Perhaps you would like to link to mine? I used to live in Howard Beach but moved away in 1976. I grew up going to Forest Park in the late 60’s and early 70’s. I was thinking about the park this morning and decided to search for facts and pictures about it. My girlfriend and I used to sit on the hill across from the bus stop on Woodhaven blvd. and watch the people. I came there with my boyfriend and played in the snow near the carousel which was closed at the time. We walked all through the west side of the park and used to sit on a big rock that was on the path. The big wooden house that I think houses the administration was empty at the time. I buried my cat on the edge of the park where it opens up to the cemetary. There was a ridge where we sat and looked out for miles. My girlfriend and I climbed the fence and watched the people playing golf for hours. Later, in 1996, I brought my son to the park on a visit from Florida where I live now. He ran up and down the hills and collected rocks. I have so many memories of this place. You are very lucky to be able to go there all the time. For me, it is a magical place with so many beautiful memories. I just saw Patrick’s post from August. 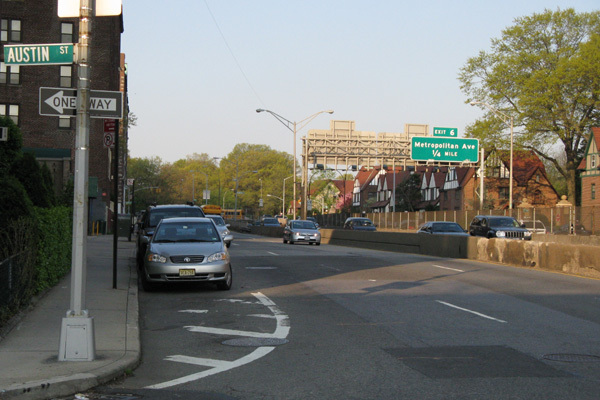 Patrick, a good place to park in order to explore the eastern section is on Union Turnpike and 71 Avenue. The Bridal Path begins there and it provides easy access to the hiking trails. Also, if you walk away from the park down 71st Avenue, there are two roads that you pass on the left. The first is Walnut Street and the second (I can’t remember the name) is about 2 1/2 blocks long. At its end, you will find the Riding Academy and stable.You can rent or store your own horse there. I’ve been in Arizona now for 20 years, but started thinking of Forest Park, where I spent much of my youth, and here I find you. Yes, the stables, if you head towards Woodhaven Blvd on Union Tpke. are accessed on the road to the right, the last one just before you get to the old elevated freight tracks bridge. You’ll want to take a left on that road, as the stables are butted-up, almost caddie-corner to those tracks opposite the crescent apartment bldg. I bet those trails are pretty with all the snow. 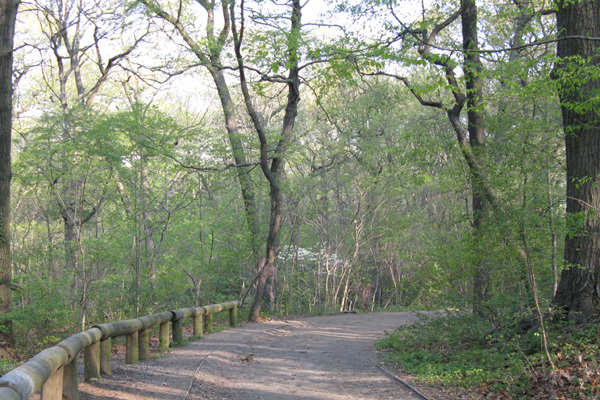 Get to know landmarks such as “Greengrass” an open, grassy field bordered by the long Island bound side of the hiway on one side and one of the largest hills in the park. Go up that hill and you’ll encounter a concrete footpath that will let you cross over Woodhaven blvd. What a wonderland. Enjoy. Wish I was there. HI, i lived in the crescent apartment building in the sixties and seventies. i used to horseback ride at the stables, at the time was called dixie dew and i forget the other stables name. We belonged to the Forest Park Country Club that was right nearby also. i cant believe they still call “greengrass” that name. our group that hung out on trotting course lane next to forest park were the originals to call it that!!!! forest park had a wonderful bandshell, and a great pizza place called victory field pizza. I LIVED IN RICHMOND HILL MY WHOLE LIFE, ON 108 ST. ABOUT A BLOCK FROM THE PARK. USED TO SPEND WEEKENDS IN THE PARK & LOTS OF TIME DURING THE SUMMER. HIKING THE HORSE TRAIL, GREAT WALK. VERY BEAUTIFUL PARK, ESPECIALLY IF YOU WALK WAY INTO IT, ALMOST FEELS LIKE YOUR UPSTATE. SOME AREAS YOU CAN GET TO WHERE YOU HEAR NO TRAFFIC. JUST AN ALL AROUND GREAT PARK. A LOT HAS CHANGED WITH THE WHOLE NEIGHBORHOOD, THE PARK ALSO. BUT STILL VERY NICE. FOREST PARK USED TO BE A GREAT PLACE TO HANG OUT IN. WHEN I WAS A KID I WOULD WAIT UP THERE NEAR THE LIRR TRACKS & WAIT TIL MY MOM LEFT FOR WORK. AT ABOUT 9:30 AM I WOULD MAKE MY WAY BACK HOME. WOULD OPEN THE DOOR & CALL OUT HER NAME, NO REPLY, GREAT, GOT AWAY WITH ANOTHER DAY!! AS I GOT OLDER I WOULD HANG OUT WITH FRIENDS AT NITE IN THE PARK, GREAT TIMES THEN. WOULD WALK ALL OVER THE PARK ON WEEKENDS, ESPECIALLY IN FALL & WINTER, VERY BEAUTIFUL PARK THAT TIME OF YEAR. I GREW UP IN RICHMOND HILL, 108 ST, JUST A SHORT WALK TO THE PARK. 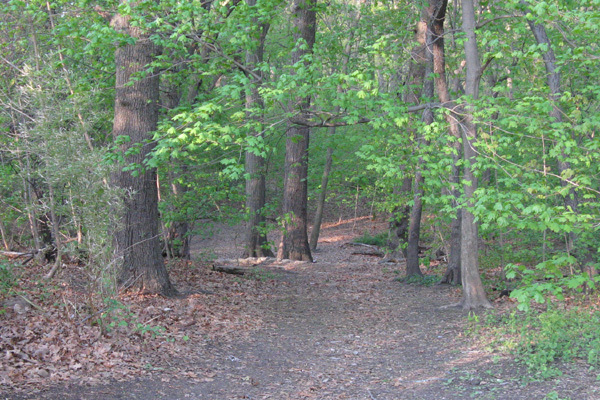 NOW I LIVE IN FRESH MEADOWS QUEENS, WENT TO FOREST PARK A FEW WEEKS AGO, TOTALLY DIFFERENT NOW. JACKSON POND HAS CHANGED, PUT A SKATE PARK THERE, NO GOOD, AT LEAST I DONT LIKE IT. BUT IT STILL IS A BEAUTIFUL AREA, VERY LUCKY TO HAVE HAD FOREST PARK GROWING UP. WAS THINKING A WHILE BACK, TOO BAD FOREST PARK HAS NO POND OR A LAKE WITH FISH IN IT, I WOULD HAVE FISHED THERE ALL THE TIME AS A KID!! !